Books by N.R. Walker are always an automatic ‘yes, I want to read’ for me. This book was very good. I loved how patient, caring, and trusting Patrick was. Aubrey has been through hell and back and thinks he finally found a place to stay awhile. Aubrey and Patrick are so sweet together. Even doing something as simple as fixing a washer together you can feel the bond and chemistry. I love how Patrick protects Aubrey and is always looking out for his well-being. They each have baggage but together they are better. This book gave me the feels, especially when Scott talks to Patrick. The epilogue was good too. Great weekend read. This was a wonderful surprise. It is the story of Aubrey, a young man running from his past, and the small island town that eventually provides him with a new home. 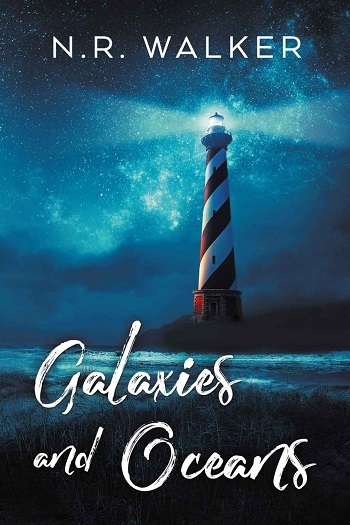 It is also the story of the romance between Aubrey and Patrick, the town’s grieving lighthouse keeper. At the start of this book, Aubrey is fragile and almost broken. I loved watching him gather strength and confidence as he grows into the new identity he chooses for himself. If Aubrey is nearly broken, Patrick is almost completely numb when we first meet him. Patrick needs the friendship that slowly develops as he assists Aubrey as much as Aubrey does. Something beautiful happens as Patrick’s heart thaws and Aubrey begins to trust again. The connection between these two is almost painfully slow but Patrick and Aubrey are really beautiful together. N.R. Walker’s settings are always breathtaking, and I loved Kangaroo island here. The author captures the power of the ocean and the brutality of the weather perfectly. I loved the vivid descriptions and the wonderful sense of place in this book. This is a beautifully written story. It isn’t as heavy as Aubrey and Patrick’s pasts might suggest. It tackles heavy topics such as grief and domestic abuse sensitively but ultimately this is a story about hope, new beginnings, and possibilities. I have read a number of N.R. Walker books, and they are all absolutely lovely reads – but this one... somehow I found this one to be the most special to date. Thank you for sharing this beautiful story. Walker has a great talent for writing about men who would not have told their own story, as they do not consider themselves exceptional, but they are so wrong. Luckily, we get to learn of their lives and loves. They are not people who have the biggest bank accounts, the most glamorous jobs, or houses – but they are full of passion, love, and a desire to engage with their fellow man. Aubrey, as I think of him, is a man who made a bad decision once, but grabbed an opportunity to reinvent himself. I worried a lot about what could happen, but as always, Walker crafts the outcome in a sensitive rather than sensational way, with some brilliant twists to ensure justice is served. His love of the stars and his grandfather's telescope guide him to the place he needs to be. Patrick has suffered the loss of his love – but he cannot deny that this quiet, underfed, mysterious newcomer to his small coastal village immediately calls to him. He is a true friend to Aubrey and the dance of their attraction and fear is beautifully played out. So, even though they are dealing with difficult pasts, they choose not to be defined by them. I most definitely recommend this beautiful book to you. 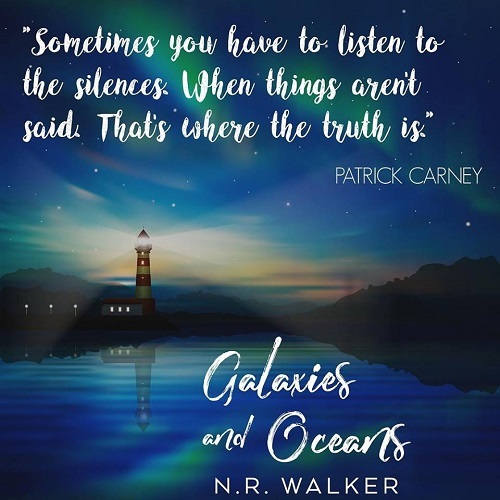 Reviewers on the Wicked Reads Review Team were provided a free copy of Galaxies and Oceans by N.R. Walker to read and review.